Sorry it’s been a little quiet around these parts recently, y’all. But I think I’ve found a way to make it up to you. There is peanut butter involved. 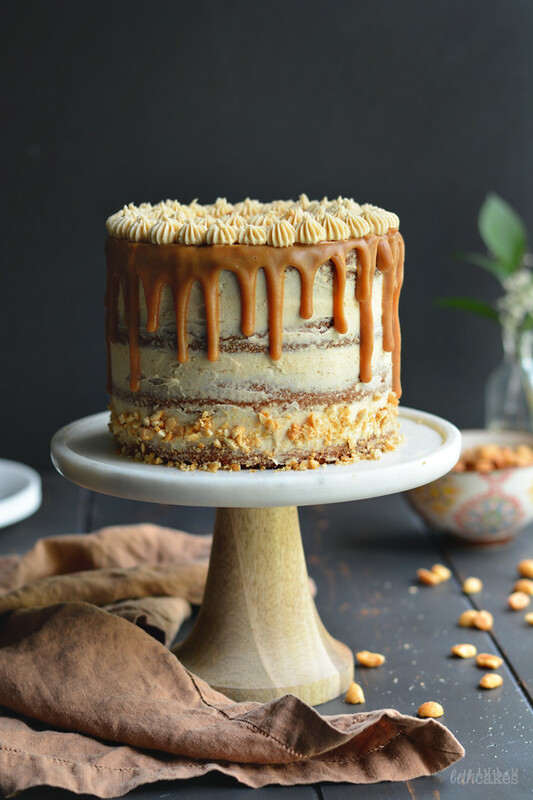 Four layers of moist peanut butter cake, the fluffiest peanut butter frosting, and a nice dose of peanut butter ganache. Does your face look like the heart eyes emoji right now, or what!? If I learned anything during the process of making this cake, it is that I really need more occasions to make peanut butter frosting, but also no, I do not because that stuff is too good. Too easy to eat it with a spoon! I have been alllllll about the drip cakes recently. I’ve used caramel and chocolate ganache, and then there’s the brightly-colored-highlighter-neon-drips trend, but I’ve been trying to think of other fun things I can use. 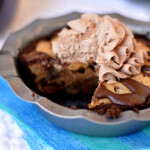 Cookie butter or mocha-flavored? Marshmallow!? Red velvet?? This cake might look like a lot, but the steps are fairly simple. The cake recipe makes enough batter to use three 8 or 9-inch pans, but I went with four 6-inch pans because I wanted a taller cake because it’s all about that drip. 1) Start with a cold cake! I like to let mine chill in the freezer for 20-30 minutes. It’s easier to spread out ganache without having to worry about messing up the frosting. 2) I like to use a squeeze bottle, but piping bags with a small tip cut off also work. 4) Method #2 (which I used with this cake): Start with the drips first. Go around the edges of the cake and pipe ganache drips, then go back and spread ganache over the top of the cake until it reaches the edges where the drips start. Having said all that, I think I like method #1 better, but the second one got the job done! Whisk together flour, baking soda, baking powder, powdered peanut butter (if using! ), and salt. Cream butter on medium speed with an electric mixer. Add peanut butter; mix well. Add both sugars and vanilla. Mix until combined. Add eggs one at a time with mixer running; mix well. Add half of the flour mixture and half of the buttermilk to the butter/sugar mixture. Mix until just incorporated. Repeat with remaining flour and buttermilk; mix until combined. Divide batter among cake pans and bake for about 25 minutes (this will change depending on the size of the pans you use), or until a toothpick inserted into the center of the cake layers comes out clean. Let cake cool in pans for 5-10 minutes, then turn out onto a wire rack to cool completely. Cream butter on medium speed with an electric mixer. Add peanut butter; mix until smooth. Add vanilla and half of the powdered sugar. Mix on low speed until just combined, and then medium-high speed until completely combined. Add 1 to 2 tablespoons of cream, and repeat with remaining powdered sugar. Press chopped peanuts into frosting around the bottom of the cake. Combine peanut butter chips and cream in a small saucepan over medium low heat. Stir continuously until smooth. Let ganache cool. I usually use a squeeze bottle or a piping bag to make the drips, and recently I came across a really great video that demonstrates how to do this. So skip to the 3 minute mark if you'd like to see how drips are done! 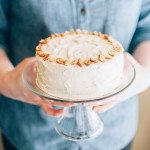 To finish off the cake, you can pipe any leftover frosting around the top and sprinkle with more chopped peanuts. Yep, you were right. ?<–That's totally what I look like right now. I want to eat that frosting with a spoon. But then I want to eat that whole cake, so…. Looks so good! I want to try it! 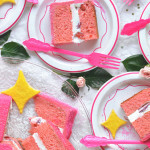 Girl, you are the cake QUEEN!! Also, I’ve always wanted to know how people get perfect drips so major thanks for the link to that video. 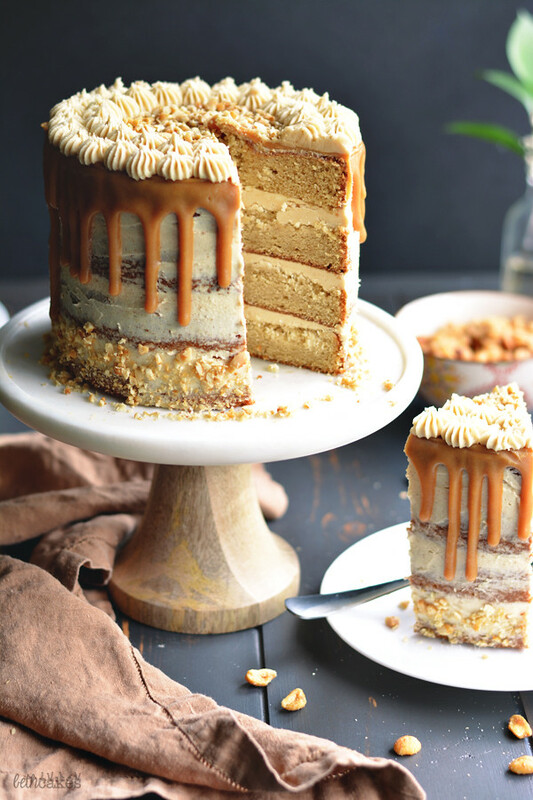 I’m a PB addict, and this cake is literally calling to me. I need to get my hands on a slice! Hi Hannah! Just thought to let you know they are both available on amazon! ;o) Now you can bake it to your heart’s delight! I’m about to try to bake it for my sister! Gorgeous (like all your cakes!)! 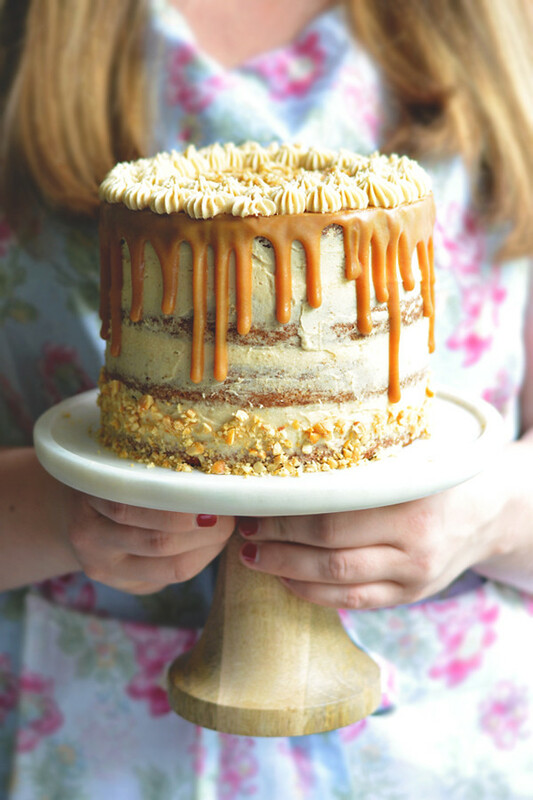 Love all of the peanut butter you packed into this cake! How long would you say the peanut butter ganache stays fresh? Can I pour it on top the night before and leave it in the fridge until the next evening for the party? Or do you think I should top it off right before the party starts? This cake was delicious and turned out beautiful. I think I will try a chocolate ganache next time to break up the peanut butter and the coloring. My cake totally failed haha! only 4 of them sunk i tried fixing it by filling the sunken parts with frosting but after had the cake stacked it sunk and fell over. why did all of this happen any tips for next time? This is beautiful, but can it be done in a 9 by 13 in. pan? I made it in one. Baked for just shy of 45 minutes. Wow! This is awesome! I copied your link over to my blog to share with all my friends. This is the best PB cake I’ve ever tasted, bar none! This cake tastes unbelievable! I made it for my brothers surprise 30th birthday party. 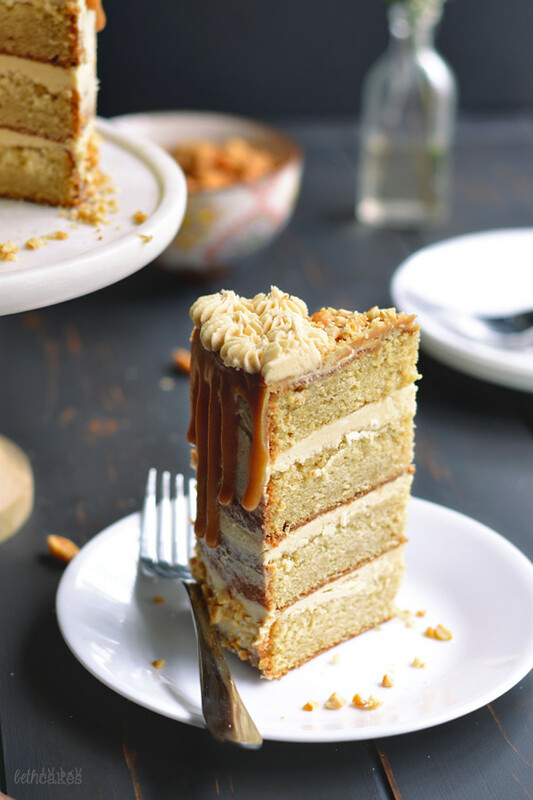 He’s a peanut butter lover, but you don’t have to be to enjoy this cake. I was scared to make it because it was my first cake I made from scratch and because I thought with all the peanut butter it might be too much. Surprisingly with the peanut butter cake, peanut butter frosting, peanut butter ganache and topped with peanuts; it was perfect. I got so many compliments on this cake. I never did drips on a cake before, so I watched that video. The drips still came out horrible. I don’t think I let it cool long enough, so the ganache was very runny. Not sure if my picture will post, but I frosted the whole cake did 3 layers of an 8″ round pan. Did not put peanuts in the frosting, but sprinkled chopped blanched peanuts on the top. I will for sure make it again and out of curiosity try chocolate ganache even though the recipe is perfect the way it is. Love the small addition of peanut butter powder, a little goes a long way and it’s fantastic! Beautiful cake and we are all peanut butter fans! 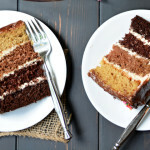 What are your thoughts on adding fudge in between the cake layers? 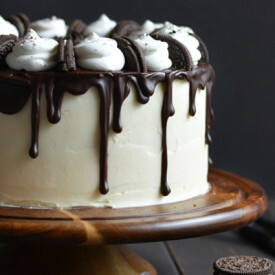 Making this cake this weekend, and toying around with that idea. Layer the PB frosting, add a thick “wall” around the cake to add a layer of fudge. Do you see any issues with doing this? Tips would be appreciated! I made this cake over the weekend for a birthday and it was a huge hit! I was in a hurry and didn’t add the drips, but everyone loved it even without the added peanut butter ganache. The true testament is that there was no cake left at all after the family gathering and that almost never happens! This will be a go-to recipe for me in the future. Thanks so much for sharing. Made this cake for my mother in law’s birthday this weekend and everyone loved it! I added a bit more peanut butter powder to the frosting to give it more of a peanut butter flavor too. 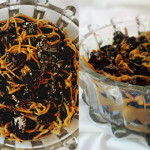 Super yummy and will definitely be adding this to my regular recipe book!